The Flagstaff office of Russ Lyon Sotheby’s International Realty hosted a Luxury Home Tour for out-of-town real estate agents to show some of the most popular luxury homes in Flagstaff. The Flagstaff Luxury Home Tour was a smashing success. Because of our participation and presentation, we received and accepted an offer on our beautiful Amberwood property at 758 N Wakonda Street less than a week later. On Friday, June 27, 2014, the Flagstaff office of Russ Lyon Sotheby’s International Realty, hosted a Luxury Home Tour for out of town real estate agents. Over 65 Realtors from Phoenix, Scottsdale, Paradise Valley, and Sedona came to see the 14 luxury homes on tour. Agents were brought up from the Valley to this all day event in Flagstaff on a luxury Motorcoach bus, sponsored by Russ Lyon Sotheby’s International Realty and Everbank. The Flagstaff Real Estate Services Group, Jeanette Sauer and Mary Mendoza had two luxury listings on the tour, one in the desirable Amberwood community - 758 N Wakonda, where Jessica Pinaire greeted real estate agents with the National Anthem as they arrived to tour the home and God Bless America as they ended their tour of the home. This seventeen year old local vocal artist, on her way to Furman University, CT in the fall to study performance arts on a scholarship was hired by Jeanette and Mary and the agents were blown away with the warm welcome. Charles Ruscher, owner of Absolute Inspiration Photography captured the wonderful moments these agents shared. Flagstaff Real Estate Services is comprised of a group of expert Flagstaff Realtors for Russ Lyon Sotheby’s International Realty, led by Jeanette Sauer and Mary Mendoza. Living in Flagstaff, Arizona, these Realtors are knowledgeable about all things related to Flagstaff and have over 35 combined years of experience in real estate. 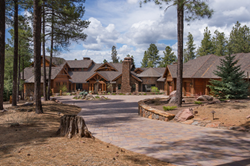 If you are interested in purchasing or selling a Second Home, Luxury Home within a Golf Community, Horse Property or Equestrian Estate, be sure to utilize two of the most talented Flagstaff real estate professionals. If you are interested in having your home featured in the next Luxury Home Tour or Luxury Home Magazine, you may contact Luxury Realtor, Jeanette Sauer, with Russ Lyon Sotheby’s International Realty in Flagstaff at 928-660-9266 or you may email her at: Jeanette.Sauer(at)RussLyon(dot)com. Her group would be delighted to assist you in marketing and selling your home.